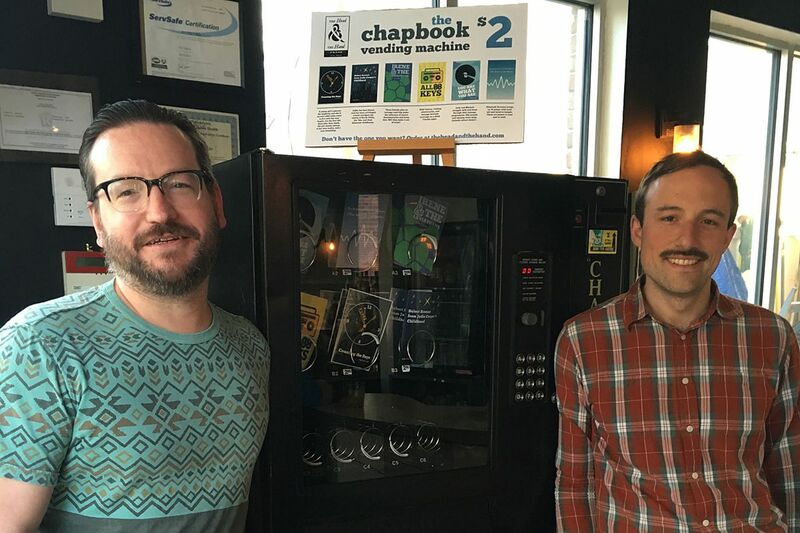 Ben Bigler (left) and Nic Esposito next to the chapbook vending machine at the Soup Kitchen Cafe in Fishtown. What if buying life-giving literature were just as easy as buying a bag of Herr's Original Crisp 'N Tasty potato chips or Goldenberg's Peanut Chews? There's a vending machine for that. Nic Esposito is the founder of Fishtown craft book publisher the Head & the Hand Press. Among his many duties, he is mixing his passions for literature and food - with a vending machine that dispenses tasty, nourishing books of locally themed fiction and poetry. Esposito sees an abiding connection between writing and growing food. "Forgive me for sounding New Agey, but there is this kindred connection," he says. "Many of the writers and farmers I know . . . continue to do this work for our civilization not just to make money, but for the basic, primordial reason that we need both writing and food to survive." Sometimes survival involves craving bite-size morsels. Hence, "The Breadbox" vending machine - dispensing Head & Hand's Chapbook Collection of locally themed indie fiction and poetry. (Chapbooks, by the way, are slim little volumes.) At the start, in 2014, the machine was at Elixir Coffee at Rittenhouse Square, where it was an immediate success. It has also been sighted at Honeygrow in Center City, Milk & Honey Cafe in West Philadelphia, and the Science Leadership Academy. This year, with new books from Tim Fitts, Michaela Prell, and American Poetry Review editor Elizabeth Scanlon, the machine is vending these "short, digestible" works for $2 (a dollar off the price at the website store) at the Soup Kitchen Cafe in Fishtown. Esposito is also busy organizing a chapbook reading for his authors on April 26 at the Win Win Coffee Bar in the Eraserhood. There's a May 13 spelling bee at Johnny Brenda's in which representatives from Philadelphia literary organizations will compete to raise money for Head & Hand, as well as "crown, once and for all, who are the majesties of orthography," laughs Esposito. He once worked in Philadelphia's Department of Parks and Recreation and the Pennsylvania Horticultural Society. Where's the lit-vending machine idea come from? It arose during a conversation at a family wedding with cousin Dave Navarra, who works in the vending machine trade. Navarra bemoaned how hard the vending-machine business had become with the push toward healthier options and the proliferation of cafe culture. Esposito listed the travails of running a publishing company in the 21st century, era of Netflix's constant stream of TV shows and, as Esposito puts it, "the unrealistic demands that Amazon's distribution systems put on us." Then Navarra told Esposito that Head & Hand should be selling books out of his machines. But they had to be small books - the size of a bag of chips. "I just thought we had too much to drink," Esposito says. "The next week, he called me up and asked me to come by his workshop. The rest is history." With Navarra's machines on "permanent loan" and Head & Hand creative director Claire Margheim's elegant design, they worked out the word count and desired thickness of the books. "Not too thick," says Esposito. "Before that, I never really read many chapbooks but since have come to love the format." His press has published 22 chapbooks so far. And Esposito had his own vending-machine business: "I was there every week, filling it up. I'm not sure what the patrons thought of me, some blue-collar hipster." He fills the machine with "beautifully written stories" that, had they not benefited from this creative form of distribution, "may have gotten buried in a long anthology or posted online. To have each story in its own book, where people can read them rather than noodle around on their iPhones," has gotten the writing, the authors, and the press much appreciation. Maybe not that much money. "Usually," says Esposito, "one printing pays for the next, with a little left over that goes back into the general fund. But it is the reason we are talking today, and the energy and awareness it brings us is what Head & Hand is and what it's all about."